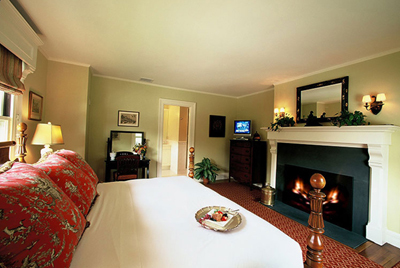 Hilltop Inn - Luxury, Location, Sophistication. 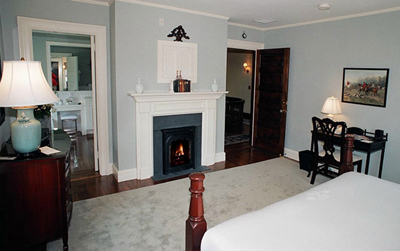 Hilltop Inn is Newport Rhode Island's newest historic inn. Located at the corner of Kay Street and Bellevue Avenue, this outstanding location places you just blocks from historic Washington Square, Broadway's shops and restaurants and Newport's bustling wharves. 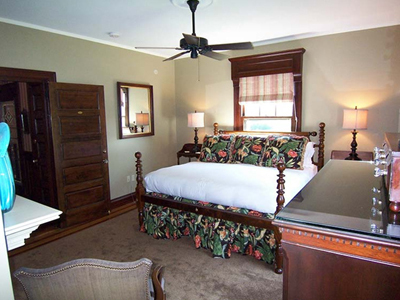 The Inn is furnished with a combination of mixed-period antiques and modern appointments such as wireless internet access, marble showers and full size jacuzzis. 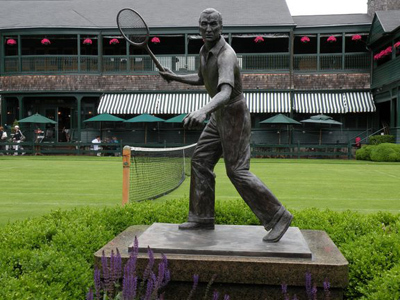 If only all New England Inns could strike such a fine balance! 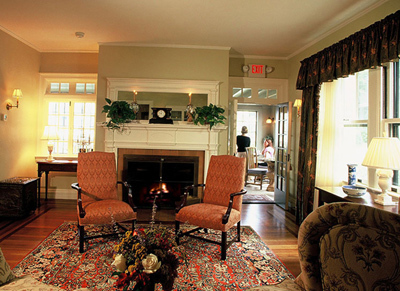 The Hilltop Inn is owned and operated by the same innkeepers that run the Francis Malbone House. If you've stayed there or read our page on the Malbone House, you can expect the same ambience, amenities and level of caring service here that you'll receive there. As I mentioned on that page, I've known the owners/innkeepers of these two locations for years. I've worked for their businesses and been their guest. They go the extra mile to ensure that every aspect of their guests' experience with them is enjoyable. 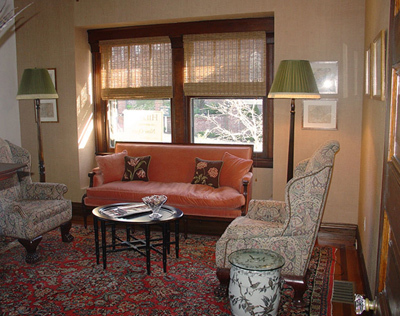 You won't find any accommodations in Newport where you're better taken care of than at the Hilltop Inn or Francis Malbone House. 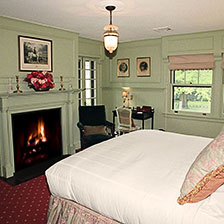 The Stewart Room is the only guestroom on the first floor of the Inn. 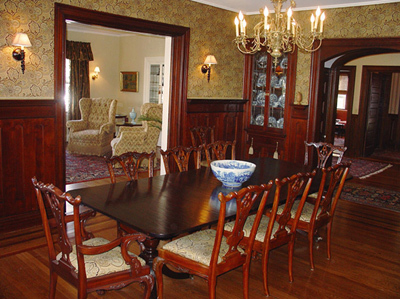 It is named after Dr. Stewart, the original builder and owner, who used this room as his home office. The marble bath contains a whirlpool tub, separate oversized marble shower with body sprays and rain shower and a flat screen plasma television. 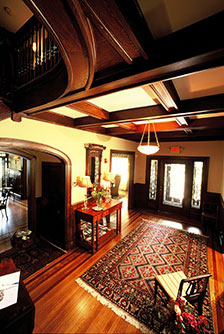 The Murray Room, on the second floor, is named for the longtime owner of the home, the Hon. Florence K. Murray. She served as the first woman member of the Rhode Island General Assembly and the Rhode Island Supreme Court. She lived in the home for 50 years. 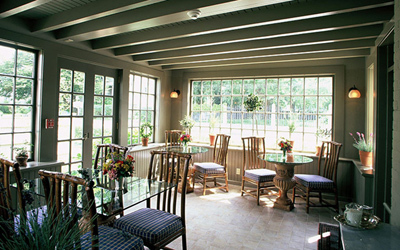 The Kay Room overlooks Kay Street, which is one of Newport's most charming neighborhoods. Many homes on this street were built by Newport's professional class at the turn of the century. The bathroom features a whirlpool tub, a separate large marble shower, a plasma television and a water closet nook. The Touro Room faces Touro Street, where just a few buildings down on your right, you'll see the historic Touro Synagogue. It's the staff that sets Hilltop apart from other Newport bed and breakfasts, but the amazing services and amenities don't hurt either. Two hot entrees are served each morning by the gourmet chef. Afternoon tea with homemade surprises like lemon raspberry squares and chocolate banana bread is served daily. Air Conditioning, Cable TV, CD Player, Refrigerator, Ceiling Fans, Central Air, Stereo, Clock Radio, Telephone, Television, Data Ports, Turn-Down Service, Desk, VCR, Voice Mail, Fireplace, DVD, Hair Dryer, Bathrobes, Bath Amenities, Wireless Internet Access and Iron/Ironing Board. Library, Copy Machine, Fax, Fireplace, Television, VCR, Laundry Facilities, DVD and Fitness Room. Desk, Television, Internet Access, Wireless Internet Access, FAX on-site, Iron/Ironing Board, Hair Dryer, Daily Newspapers and off-site Dry Cleaning Services. 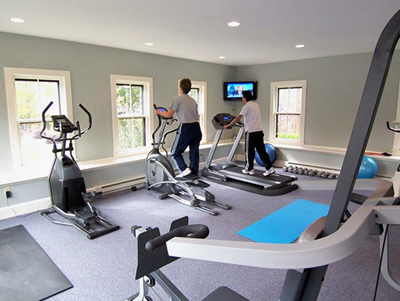 The Hilltop even has its own Carriage House Fitness Center, which features an elliptical and a treadmill, a bicycle, weights and flat screen plasma televisions. If you'd rather get your exercise while exploring Newport outdoors, bicycle rentals can be arranged for you as well. 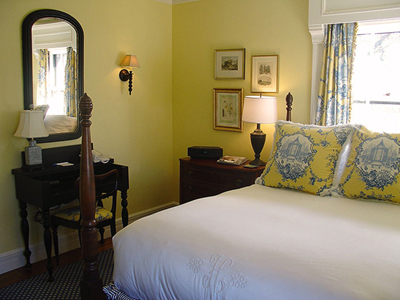 If you're interested in Newport Rhode Island bed and breakfasts, you might as well stay in one that's in a great location and offers superior services and amenities. No need to look any further than the Hilltop Inn. 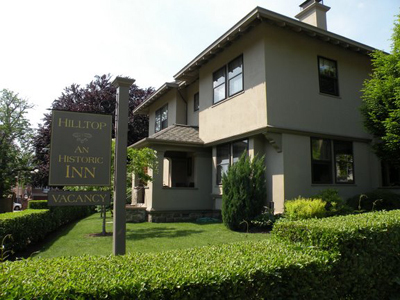 Contact Hilltop Inn now to book your stay. Just fill out the form below, and someone will contact you with the information you're looking for.